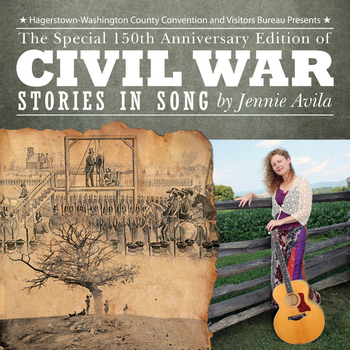 Civil War Stories in Song was created through a special arrangement between the artist and the Hagerstown-Washington County Convention and Visitors Bureau. As part of this arrangement, Jennie Avila could not give permission for the posting of a song from the album. Streaming audio clips of parts of the songs may be heard at the purchase link above. Jennie Avila was kind enough to send one of her earlier albums, so that I could give you an idea of her sound. You will find one song from that album at the end of this post. Jennie Avila sings in a soprano voice that exudes sunlight and optimism. This is a voice that would be well suited to making music for kids. In fact, Avila has done that, and it really worked. I will be doing a set of kid’s music soon, and you will get to hear that. You would not expect the owner of such a voice to be doing a set of songs about the Civil War, but here it is. The Civil War was probably the most anguished war in American history. Brother sometimes fought against brother, and the whole thing took place within our borders. My readers from other countries should bear in mind that this almost never happens in the United States. So, Avila could easily have focused on the harrowing aspects of the war. Some great music has come from that, and Avila doesn’t downplay the serious nature of her subject. But she also finds a way to tell some stories that don’t usually get told. Avila lives in Maryland, a border state between the two sides in the war, and she takes much of her inspiration from the objects on display in a historical museum in Boonsborough. Here, one may see objects carved from bullets used in the war, a desk made from the scaffold where John Brown was hanged, and pages from Clara Barton’s diary. Each of these gets a song. The bullets inspire an ironic song about what the bullet did as a bullet and in its new form. The man who made the desk is presented sympathetically; there could be no ethical dilemma for him, when usable wood was scarce. And the diary pages inspire a tribute to a war hero of a sort that was new to that war. There are also a couple of battlefield tales, and Avila pulls no punches there. But the gore and mayhem are never the point; the people are. Throughout, the emphasis is on how individuals were affected by the war and its aftermath. Avila never forgets that these were real people, and you feel their love and fear, and hope. Breakfast at the Heck’s presents a pair of brothers who find themselves home at the same time sharing a meal, and then returning to the battlefield on opposite sides. Family provides a brief respite from the madness, and Avila makes you feel it. The songs are all based around Avila’s voice and acoustic guitar. Other instruments are used sparingly, and mostly for color. These include fiddle, banjo, mandolin, and percussion. Avila uses fuller arrangements in her other work, but here the spareness really suits the material. Warrior Spirit and the Keeper of the Bones uses just guitar and percussion, but this is the emotional high point of the album. This is a tale of a badly wounded soldier and a ghostly vision. I don’t want to give away more, but this one really tugged at me. My only complaint? This is an EP, with just six songs. If Avila could have presented another six songs this good, I would have gladly kept listening. Meanwhile, as promised, here is Oh Good(bye) from Avila’s previous album Naked in the Rain.